Bing search engine from Microsoft has daily fresh eye candy wallpaper on its homepage. We have already seen number of tips and resources to grab those cool images from Bing homepage. Bing recently organized contest inviting users to send their photos to appear on Bing homepage. As expected, lot of entries were received. 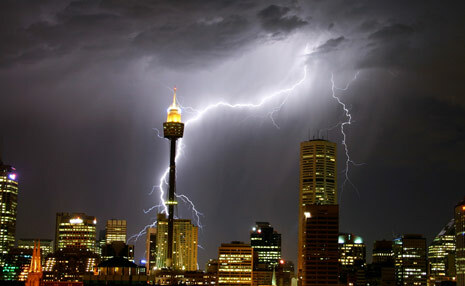 An image featuring Sydney city night view lit up by an amazing lightning storm won the contest. This images was captured by Jeremy who started his own photography company with a friend at the age of 16. Here is little story behind this wonderful image (by Bing Community). “… From his Grandmother’s apartment building in Sydney, Australia Jeremy took this photo using a Canon 300D, set on a tripod with a 30 second exposure, standing out in the open for four hours in the drizzling rain. He took more than 700 shots with about 80 of those capturing lightning. Of those 80, this one shot really captured what this storm had to offer that night”. Besides free wallpaper download, you can also order print or high resolution digital version of this image. More at Jeremy official website. i am always interested to join photocontests specially if there is a great deal of price on it .*. hey guys can u suggest me some awesome sites like desktop nexus or better than nexus??? ?if u knows thn pls mail those sites name 2 me in my mail-box ..riya88funllover@yahoo.com ……………..n if u knows some other awesome n interesting sites thn pls tell me…………i’ll b glad n thnk’ 2 tht person.